Dust off those backpacks and sharpen your pencils! Back-to-school time is just around the corner and we have got a great word search to get you back into the school mode. Teachers and substitute teachers, did you know that Printables4Kids activities are a perfect companion for your classroom? Feel free to make copies and use them in conjunction with lesson plans, as rewards, or for quiet time activities as needed. 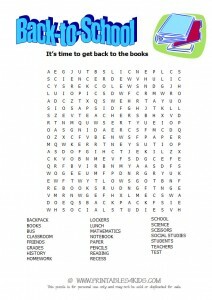 Or download the Back-to-School Word Search as a PDF file. Get your kids warmed up for school with this fun, printable word search…. What a nice site you have! You share lots of great things. I’ve bookmarked you to come and visit again.